It’s no secret our diets have changed since the industrialization of food, 18 wheelers, and grocery stores with their shelf stable food. It is generally accepted that agricultural humans today have a diet poor in most nutrients compared to our ancestors, especially magnesium & potassium (which are both electrolytes) – and that we’re getting more than our share of simple sugars, sodium, and chloride. What this ultimately puts at risk is our pH. Not blood pH because our bodies do everything they can to keep it absolutely stable. But in its’ efforts to maintain blood pH, our body pulls minerals from our bones & teeth to alkalize our poor diet intake. Eating a diet rich in meat (hello paleo done wrong! ), wheat & grains, sugar, and processed foods spurs on this imbalance between acids and bases. Do you remember anything about chemistry class? Acids and bases neutralize each other and it’s the same thing in our body. Our poor diet is the acid. Our bones offer the bases needed to maintain blood pH. Acidity is also linked to chronic inflammation, the current root cause of about any disease or syndrome here in 2014. So what’s a gal or guy to do? I’m here to share 9 habits of healthy people. Drink Fresh Green Juice & I’m not talking juice that is really just sugar (beets, apples and carrots). I’m talking green juice. 1/2 liter of fresh green juice with spinach, kale, cucumber, celery, parsley, etc. would deliver about 2000 mg of alkalizing mineral compounds! Drink Organic Greens Powder – similar effect but without the work of purchasing, washing, juicing and the clean up. I have a juicer but if I’m traveling or really in a hurry, I use pHresh Greens. They are 100% certified organic and dried at low temps so as not to destroy the enzymes found in raw food. If you opt to try these from Phresh products, use the coupon code “tracykonoske” at checkout and get 10% off your order. Drink Baking Soda – ½ tsp in a glass of water between meals. The goal is not to neutralize your own stomach acid but to alkalize between meals. Carbonated Mineral Water – I sometimes drink Pellogrino brand carbonated mineral water for an afternoon treat or for a “healthy happy hour”. I like that it comes in glass, not plastic. I don’t like that it’s imported from Italy – not exactly local. But they carry it at Costco and the price is reasonable for a sometimes indulgence. Take Your Electrolytes – are minerals. Sodium, Potassium, Magnesium, Calcium. Remember, if we don’t get enough minerals in our day to day diet, we literally pull them from our bones. See my article HERE on how critical electrolytes are for optimal daily function. I dose electrolytes based on my patients’ needs – it’s not a one size fits all. Talk to your integrative practitioner! Use Himalayan Salt – 1/8 tsp in a smoothie each day provides over 80 trace minerals! Or use at the table! Garden in mineral rich soil: Even the pH of the soil in which plants are grown can have considerable influence on the mineral content of the food we eat. Eating organic is great of course but organic doesn’t define if the soil is replenished each year. Alkaline forming foods are naturally rich in anti-oxidants and phytochemicals (aka plant foods). Remember this: eat a diet, mostly colorful plants, and make half of it raw in some form or another. Cancer can’t live – you hear this time and time again. Someone gets cancer, they start juicing (IE alkalizing) and their cancer goes into remission or just flat disappears. Do we know if we can prevent cancer? Not really because we don’t have a crystal ball to know who will get cancer. I juice to hedge my bets. Athletes recover quicker & have better performance. Our muscles are able to work better, and they require less force to move. As an endurance athlete, this will allow you to push harder for longer. If you are a strength athlete, this allows you to lift heavier weights. All athletes will benefit from recovering faster when eating more plant-based foods. SIBO – Small Intestine Bacterial Overgrowth. Being chronically acidic opens the door to SIBO as our digestive enzymes can’t work as efficiently. When our HCl (hydrochloric acid) is diminished, pathogens can overgrow. We have HCl for a reason! I see this weekly and have my patients alkalizing!!! 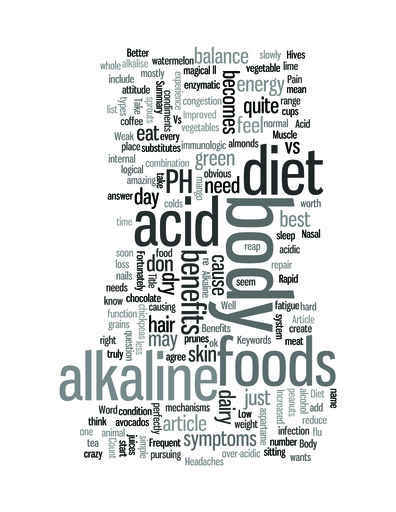 Even the conservative National Institutes of Health (NIH) says: There may be some value in considering an alkaline diet in reducing morbidity and mortality from chronic diseases and further studies are warranted in this area of medicine.